Tenderfoot is one of Dribble & Spitz's microgames in WarioWare: D.I.Y. Showcase. 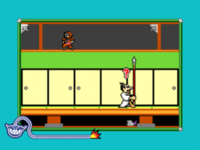 To win, the player needs to successfully stab the ninja upstairs with the spear. However, they must be precise with their strike, or else the ninja will dodge. This page was last edited on October 8, 2018, at 19:28.